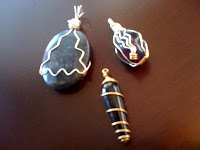 I took a great class at Nomadic Notions for Stone Wrapping taught by Mick. It was great fun and I learned a lot. The wire work is my favorite. Here are the 3 beads I wrapped in class. I really like the bead with the triangular wrap, even the bale is triangular.